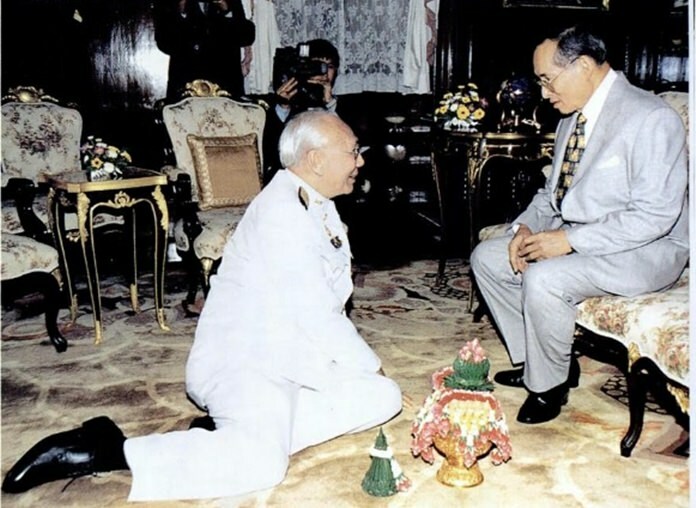 HM King Bhumibol Adulyadej grants an audience to Bhichai Rattakul before the latter embarked on his journey to serve as President of Rotary International in 2002-03. 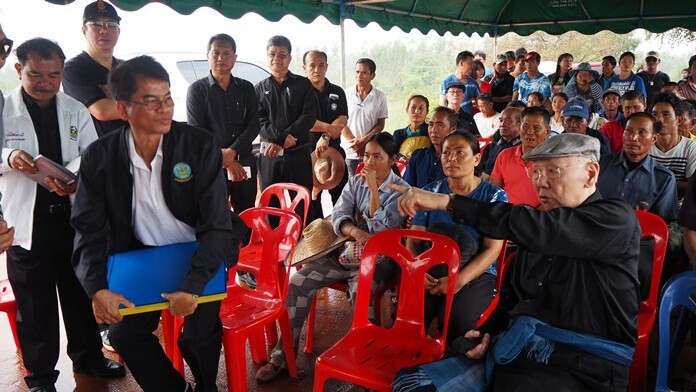 During his 69 years of Reign as King of Thailand, His Majesty King Bhumibol Adulyadej, Rama the Ninth of the Thai Chakri Dynasty had spent most of his entire life visiting the countryside and had initiated and implemented thousands upon thousands of projects to help the farmers and the poor people. His most significant project which had been close to his heart had always been ‘water’. This is because he knew so well that if we can provide sufficient water we would be able to make the livelihood of the farmers better. 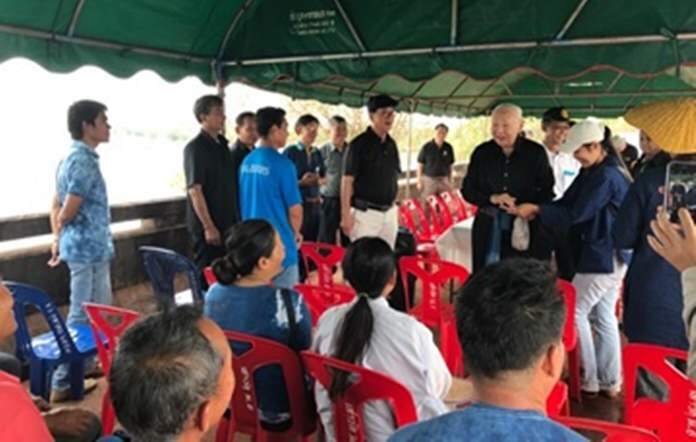 PRIP Bhichai Rattakul travelled to Nong Nontai in Sakon Nakhon province to personally inspect the Monkey’s Cheeks project. But, it was not easy task. It needs one’s conviction, determination and hard work to overcome the problem in order to find sources of water anywhere, especially in the Northeast of the country which rarely has enough rain water from the streams sufficient enough for the farmers to till their land and grow their crops. His Majesty’s Vision was that the country needs badly and urgently ponds that could store the rain water during the rainy season. 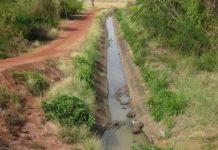 And during the dry season to release the water which was stored during the rainy season from the pond into the farmland for the farmers. After working so tirelessly for years after years, thousands of such ponds were built in all parts of the country. As a result, the farmers were able to plant 2 to 3 rice crops in a year, as well as other crops all year round. His Majesty King Bhumibol Adulyadej has now gone … leaving 70 million of his subjects mourning with grief for this great loss. However, he left behind him his remarkable vision in the development of the country in so many ways. He had not only shown to us but was always on hand to do and supervise the work by himself … the work that he truly believed would give his people a better life. If the Thai people could follow the path he had shown and led us for 69 long years without uttering a word of complaint or disappointment it would show to the world of the love, adoration and the great respect the Thai people have toward their most revered King of Kings! The Kaem Ling Project (Monkey’s Cheeks) which His Majesty had introduced and implemented was constructed with His Majesty’s own personal money. 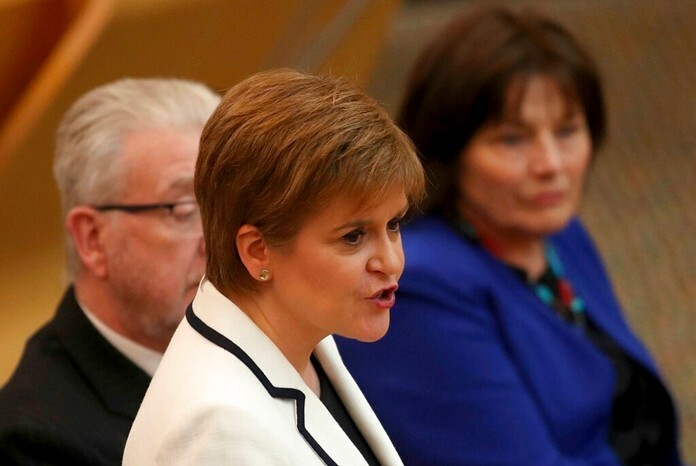 Later on, each year the government set up a special budget for this undertaking until now. However, there are still many lands which badly and urgently need such ‘Ponds of Love’. We must admit to ourselves that although His Majesty is no longer with us, his legacy, his dreams are very much alive, and whatever the Thai people can do to fulfill His Majesty’s Dream it is only fitting that the Thai people must continue to do what His Majesty had done for his people for as long as almost 70 years of His Reign. 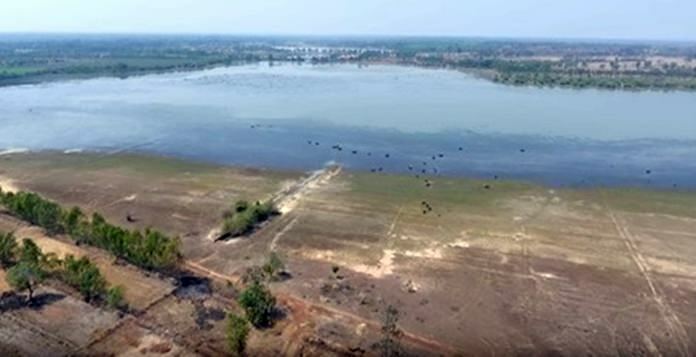 An aerial view of the Nong Nontai area where the ‘Lake of Love’ will be built. His Majesty King Bhumibol Adulyadej was the Royal Patron of the Rotary Movement in Thailand. And it is for this reason alone that the Thai Rotarians should do something in remembrance of our Great King, Rama the Ninth. The ‘Lake of Love’ came to my mind. It so happened that I have had the honour of serving His Majesty in many royal projects in the past, and I know that wherever His Majesty is now, His Majesty will be happy to see someone carry on these projects. 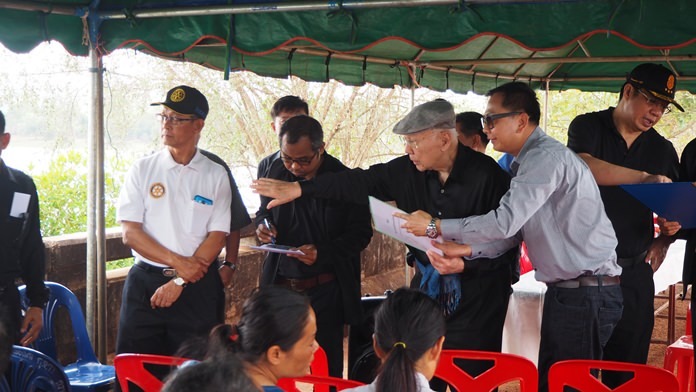 And with the help of the Thai Rotarians and their friends locally and abroad I am quite certain that Rotary will be able to play a small part in sharing the Dream of a Great King, Rama the Ninth. I spent many sleepless nights thinking about the best way to start implementing the project ‘Lake of Love’. I thought that whatever little Rotary can do in this respect I was quite certain that my Rotary friends here and abroad, and my local business friends would give me a hand to make this undertaking a success. I started earnestly, after deciding that ‘The Lake of Love’ project is the closest to the heart of His Majesty, and the most desirable one by the people at the grassroots, I started with the strong determination that I must do everything I can to make this project become a reality. I took the immediate step in contacting the Thai Ministry of Agriculture, especially the director of the Irrigation Department and consulted with them about Rotary’s plan. We have now agreed to construct ‘The Lake of Love’ in two phases. After the completion of the two phases the pond will be 812 metres in width, 1,000 metres in length and 3.5 metres in depth. To achieve this, as much as 2,108,750 cubic metres of mud and rocks will have to be dug out. 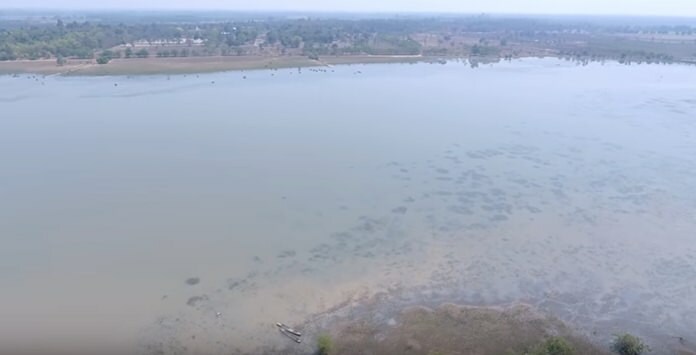 It will store as much as 2.40 million cubic metres of water during the dry season. This amount of water is sufficient for several thousands of farmers to till their lands during the dry season. This would mean that they will be able to grow 2 to 3 crops of rice in a year, as well as other crops. As a result it would increase their income and give them a better livelihood. The cost of the construction is 35 million Thai baht, or approximately US$ One million. 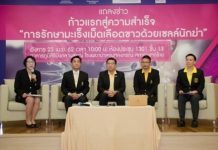 The first payment of ten million baht will be in November 2017. The second payment of another of ten million baht will be in February 2018 and the last payment of fifteen million baht will be made after the completion of the construction in April/ May 2018. An M.O.U. will be signed by me with the director of the Irrigation Department soon. The work will start in November 2017, and will be complete in May 2018. 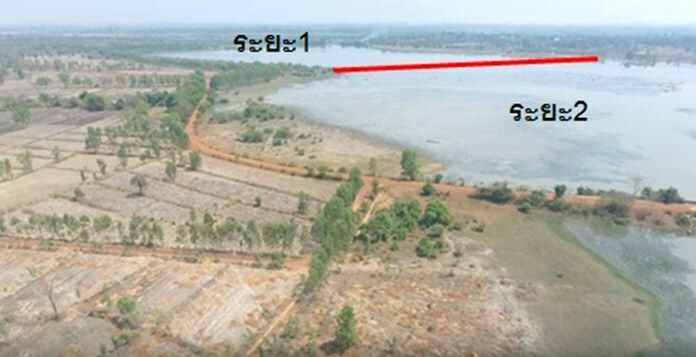 The site of this project is the village of Ban Sao Wat, Moo 2, Tambol Pone Ngarm, District Arkartnuay, Sakon Nakhon Province, Thailand. I need your support! I need every baht you can afford to fulfill this most worthwhile project! Not only your personal support, but your District DDF fund is another source of contribution toward this project. 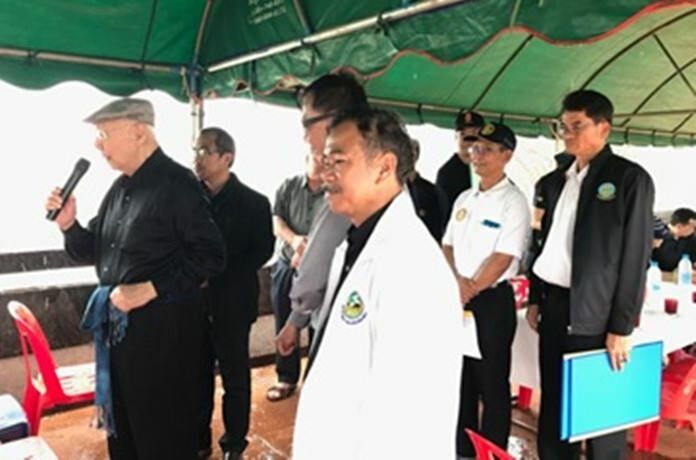 A committee to administer this project has been set up with my humble self as chairman, with three more past governors and one past club president who is a member of the Rotary Club of Sakon Nakhon where the pond will be constructed. If you are kind enough in your decision to support this appeal, please send the donation to: Thai Rotary Districts Foundation (Donation), Kasikorn Bank, Thanon Ratchda Phisek (Sukhumvit – Rama IV), account number 718-2-29510-2 (savings). Swift Code: KASITHBK. Address: 193/5, Lake Rajada Office Complex, Ratchada Phisek Rd., Klongtoey, Bangkok 10110. For your further information, after the completion of the Lake of Love, we will have the account audited and report back to you. We will also report to you from time to time about the progress of the construction. Please contact the director of the Thai Rotary Centre, Miss Danucha Bhumitavorn at her email: [email protected], or to me at my email address: [email protected] any information you may need. I look forward with great anxiety to hearing further good news from you. Please accept my sincere thanks in advance to each and every one of you. 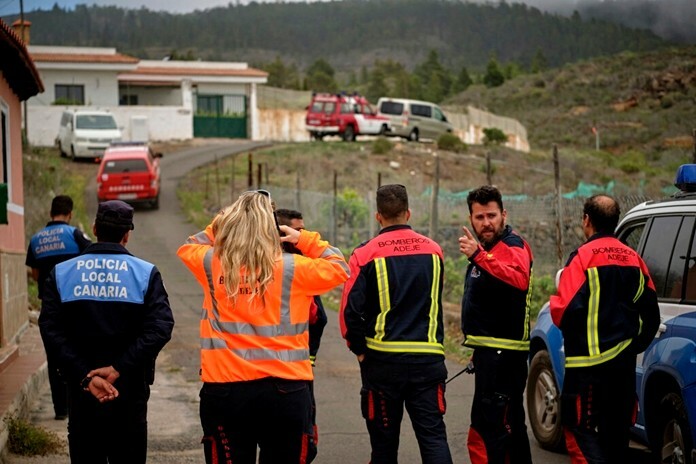 The government is focusing efforts to prevent water-related disasters. It has adopted proactive measures, such as the development of water reservoirs through the Kaem Ling Project. Literally meaning “monkey cheek,” kaem ling is a well-known flood-control project initiated by His Majesty King Bhumibol Adulyadej, who observed that most monkeys, when they obtain bananas, usually store them in their mouths, and then they gradually chew and swallow them. His Majesty modelled the concept for water retention after the way monkeys eat bananas by temporarily storing excessive water during heavy rains and afterwards gradually draining it. This technique helps alleviate the flood problem. It also helps store water to ease drought problems. 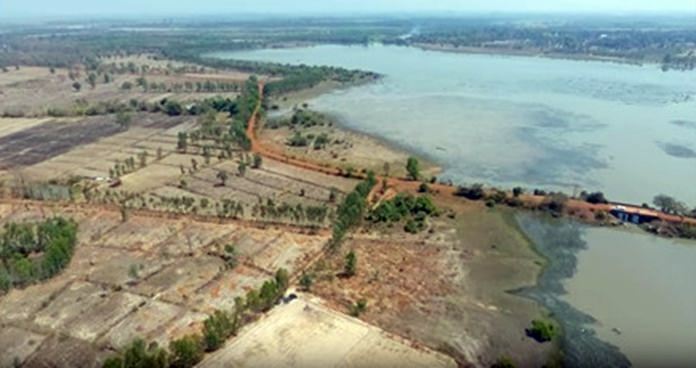 The Ministry of Agriculture and Cooperatives is building more kaem ling, or water retention areas, to help ease drought. 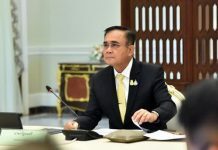 A&C Minister, General Chatchai Sarikulya said Prime Minister Prayut Chan-o-cha has accelerated this project and called for an urgent study, which also involves an environmental impact assessment.